We discovered the world of the Moomins via this book when my cousin sent it from Finland as a gift for my son (now almost 1) and daughter (now almost 3). It is her daughter’s favorite book and I can see why. It has a Dr. Seuss-like quality in that it features vivid colors and characters in a strange and interesting world, made all the more amazing by die cut pages. I didn’t think books like this were being published in 1952, but almost every page connects to the next page via cut outs that enhance the story. I don’t find the milk references problematic especially considering the characters are also offered roses and shells as food in the book. 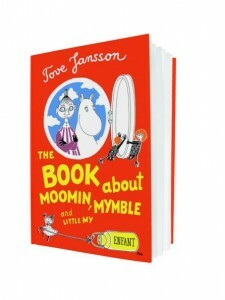 My daughter loved the book and we have since found more adventures in the world of the Moomins. The best thing is that the bulk of the Moomin books are more like small novels, so if your little one is into this book, there are some wonderful reads ahead like Comet in Moominland. A fantastic, unique read aloud book that encourages the reader to guess what is next and use their imagination. Good for reading aloud to children as young as 2-1/2, although older kids will like this one too.